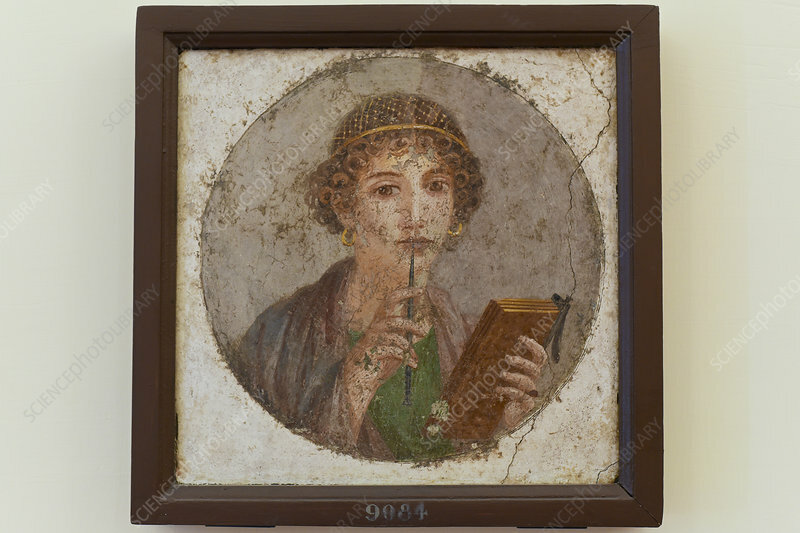 Pompeiian woman with wax tablet, portraying a Roman woman with gold-threaded hair and gold ear-rings, with a stylus held to her mouth. Pompeii on the shores of the Bay of Naples, Italy, was a Roman town destroyed by the eruption of the volcano Mount Vesuvius in 79 AD. The eruption buried the town under a thick layer of ash, and it remained undiscovered until 1599. It was not until 1749 that attempts were made to excavate the town which has been very well preserved in the ash. This portrait was discovered in 1760. The excavations revealed a huge amount about daily life at the time. The entire site is now a UNESCO World Heritage Site. Photographed in 2017, at the National Archaeological Museum of Naples.